Foodista | Q-Grapefruit Soda- Brilliant!!! Q-Soda.. it's brilliant.. Crisp. Aromatic and Refreshing. 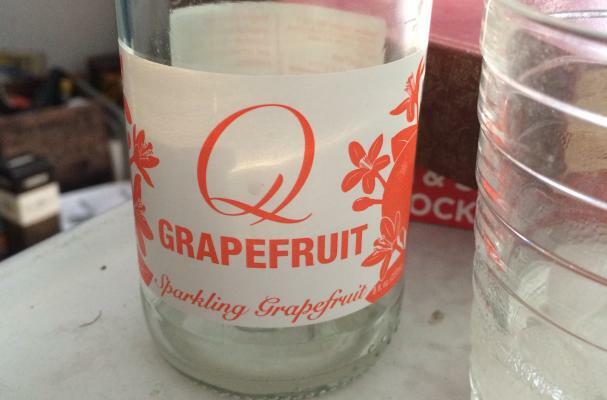 The Q-Drinks Grapefruit, made by my friend Jordan Silbert is nothing short of perfection. I crave this grapefruit soda... A combination of Mexican Tangerine, Italian Lemons, Key Lime and sumptuous Florida Grapefruit, this soda is the perfect foil for hot weather sipping. And for just cooling down. My day yesterday was spent running hither tither around the Javits Center in NYC... The event was the International Fancy Food Show and my friend Jennifer Cohan so kindly secured me a Press badge.. thank you! As I was growing weary by the end of the day, I spotted the Q-Drinks booth. I was thirsty. They were there- like a beacon from above- drawing me closer and closer. It was time to re-introduce myself- as if I had to do that! The John Bull Fizz,... named after John Bull in Robert Louis Stevenson's Travel's and Essays. Top with Q-Grapefruit soda.. did I tell you it's gorgeous stuff???? Dot with Aromatic Bitters of your choice * I used the bitters from Bartram's Gardens in Philadelphia, Pa. I have a new book out! It's named Bitters and Shrub Syrup Cocktails. It's a deep dive into the days before electricity when most everything that you ate was poisonous to the gut. This was the time when food was either eaten fresh or not at all. And if you wanted something to last you'd better know about canning or... making shrubs!